Halliburton, the oil field services contractor, agreed to plead guilty to destroying evidence related to its complicity in causing the 2010 Deepwater Horizon disaster, which killed 11 workers and spilled nearly 5 million barrels of oil into the Gulf of Mexico. The company was charged with one misdemeanor count of destruction of evidence in a New Orleans US District Court. It will be fined $200,000, and one of its subsidiaries will be put on three years probation, according to a statement issued by the company. The fine, amounting to less than one tenth of a percent of Halliburton’s $679 million profits in the second quarter of this year, is less than a slap on the wrist and constitutes a de facto government approval of Halliburton’s criminal activities. Last year, the company set aside $300 million to cover possible fines related to the case. “In agreeing to plead guilty, Halliburton has accepted criminal responsibility for destroying the aforementioned evidence,” wrote the Department of Justice. The plea by Halliburton followed a guilty plea and $4 million criminal fine for BP, and a $400 million fine for Transocean for violating the Clean Water Act. A civil lawsuit filed against the companies by the Department of Justice in February is ongoing. The Macondo prospect, where the disaster took place, was 65 percent owned by BP. The company leased the Deepwater Horizon rig from Transocean to drill the well, and key elements of the drilling process were contracted out to Halliburton. Cost-cutting by all three companies contributed to the disaster, including insufficient testing of the cement mixture used to cement the well, the decision to use fewer than the standard number of “centralizers” in the cementing process, as well as a faulty blowout preventer that was designed to seal the well in case of a disaster. The Deepwater Horizon drilling rig was in the process of completing an exploratory oil well 41 miles off of the Louisiana coast when natural gas rushed up the well, fueling a massive explosion that caused the rig to catch fire and subsequently sink. On April 19, the day before the explosion, Halliburton completed the cementing process that would finish the well and leave it ready for production. While the company recommended the use of 21 “centralizers” to center the production casing inside the well bore prior to cementing, BP decided to use only six in order to save time and money. Following the disaster, Halliburton set up an internal working group to look into the causes of the explosion. On two separate occasions, the group ran computer simulations comparing the effects of using 21 versus six centralizers that found little difference between the two approaches. On both occasions, Halliburton instructed its employees to destroy the studies. Following the simulations, Halliburton continued to claim that the failure of the well’s cementing was due to BP’s decision to disregard its recommendation on the number of stabilizers, and destroyed the studies in order to shore up its attempts to make BP take more of the blame. Fred H. Bartlit, Chief Counsel for the National Commission on the Deepwater Horizon Oil Spill, reported to the commission in an October 2010 letter that the type of cement used in the Well would be unstable, and that Halliburton had reason to suspect that its cementing method was inadequate. “Only one of the four tests discussed above that Halliburton ran on the various slurry designs for the final cement job at the Macondo well indicated that the slurry design would be stable,” he stated. As a result of the criminal negligence of both BP and Transocean, 11 workers lost their lives, hundreds of thousands of people saw their livelihoods upended, and the ecosystem of the Gulf of Mexico was vastly damaged. Halliburton’s guilty plea, however, fully exempts it from further criminal liability, both for crimes that have already been discovered and those that have yet to be revealed. 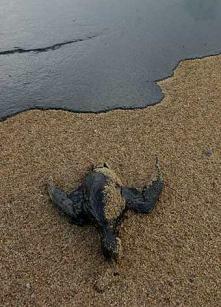 On June 16, BP announced the formation of a $20 billion fund to settle claims of economic damage relating to the spill. The fund, which is now closed, has paid out only $6.2 billion, and the fishermen and small businessmen who filed claims had to waive their rights to further lawsuits in order to qualify. The settlement with Halliburton is entirely of a piece with the US government’s overall response to the oil spill, which has consisted of seeking to downplay the extent of the damage in order to limit the liabilities of the companies responsible. The increased production of domestic oil and gas, including in the Gulf of Mexico, is a key part of the Obama Administration’s energy policy, and the administration continues to open up new areas for offshore drilling there.